[2015 Nov] Bodies of murdered Palestinians are being returned by israel with organs missing The Palestinian ambassador to the United Nations (UN) says the Tel Aviv regime is harvesting the organs of Palestinians killed in clashes with Israeli forces in the occupied territories. Riyad Mansour said in a letter to UN Secretary General Ban Ki-moon on Wednesday that the bodies of the Palestinians killed by Israeli forces are “returned with missing corneas and other organs, further confirming past reports about organ harvesting by the occupying power.” “A medical examination conducted on bodies of Palestinians returned after they were killed by the occupying power found that they were missing organs,” Mansour wrote in the letter. [2011 Oct] NY organ trafficker admits buying kidneys in Israel for $10,000… and selling them in U.S. for $120,000 anthropologist and organ trade expert Nancy Scheper-Hughes, who described Israel as a ‘pariah’ in the organ transplant world, has said in the past that many of the donors were desperately poor immigrants from eastern European countries such as Moldova, Romania and Russia. They say the recipients are leading healthy lives thanks to Rosenbaum…..The probe led to 46 arrests, including several rabbis, the New York Daily News reports……Prosecutors said he bought the organs from vulnerable people in Israel for as little as $10,000, then sold them here for a minimum of $120,000. [2011 Feb] Israel Economy for Beginners by GILAD ATZMON Increasingly, Israel seems to be nothing more than a humongous money laundering haven for Jewish oligarchs, swindlers, weapons dealers, organ traffickers, organised crime and blood diamond traders…..it seems to me that the Israeli-Palestinian conflict, and Israel’s horrendous crimes against the Palestinian people, actually serves to divert attention away from Israel’s complicity in some colossal and global crimes against vast populations around the world. …..To Dr. Kugel the prime issue had nothing at all to do with science: it was about disrespect, about hoarding body specimens, about turning the Institute intoa factory of bodies. The Institute’s conduct was motivated by money, by power, and by authoritarian paternalism of the sort that says, “We know what’s good for you, we’ll decide what happens to you, the person who doesn’t know anything. We’ll decide.” And that’s the reason why that happened, and Dr. Kugelasserts it is happening to this day. 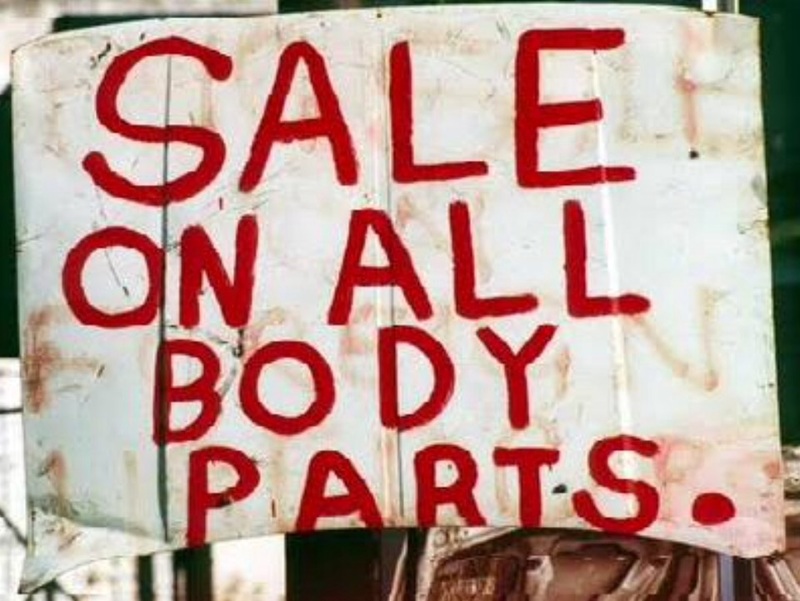 Organ Failure The arrests of rabbis who trafficked body parts uncover more complicated issues. Israeli organ traffickers shift operations to China There is no law in Israel against organ trafficking and government policy effectively encourages it by allowing Israelis who go abroad for transplants to be reimbursed as much as $80,000. “As for the Goyim… Zalman’s attitude (was): “Gentile souls are of a completely different and inferior order. They are totally evil, with no redeeming qualities whatsoever.”…If every simple cell in a Jewish body entails divinity, is a part of God, then every strand of DNA is a part of God. Therefore, something is special about Jewish DNA…” “…If a Jew needs a liver, can you take the liver of an innocent non-Jew passing by to save him? The Torah would probably permit that. Jewish life has an infinite value,” he explained. “There is something infinitely more holy and unique about Jewish life than non-Jewish life.”— Chabad-Lubavitch Rabbi Yitzchak Ginsburgh in “Jewish Week,” the largest Jewish publication in the United States, April 26, 1996. Bilal Achmed Ghanan, 19, was shot and taken away by Israeli soldiers. The body was returned stitched together from the belly to the neck. Levy Izhak Rosenbaum being led away by FBI agents. Rosenbaum is alleged to have functioned as a middleman in the illegal organ trafficking scheme.